There’s a lot of variety when it comes to Celebrity Slam. Working on this feature weekly leads us to discover celebrity idiocy on scales large and small. From faux pas to felonies, we run the gamut here. Sometimes, the stupidity we address is big and awful, packed with significant ramifications. This will not be one of those times. However, we WILL be addressing a longtime Celebrity Slam favorite. Everyone’s favorite ego-bloated musician/reality star husband is back at it again. And while there are plenty of big things for which we could go after Mr. Kardashian, we’re instead going to focus on a small thing that, to our minds, really points out what a self-involved turd Kanye really is. Kanye and Kim apparently had a bit of a date night early this week; the pair were in New York City and so decided to do what people do in NYC and take in a Broadway show. The one they chose was “The Cher Show,” a jukebox musical telling Cher’s life story … and they turned up on opening night. They weren’t the only celebrities in attendance – hell, Cher herself was in the building – but they were certainly the only ones who got dragged on social media for their behavior during the show. Yeah, one of the stars of the show called Kanye out for being an inattentive jerk DURING THE SHOW. For his part, Kanye did respond with an apologetic tweet, albeit one seemingly related to some other perceived slight. The forever-ephemeral “sources close to Kanye” have apparently said that Kanye actually loved the show and that his phone was out because he was taking notes for some reason. Also, he and Kim were reportedly scheduled to leave at intermission but enjoyed it so much that they pushed back their flight so they could stay for the end. 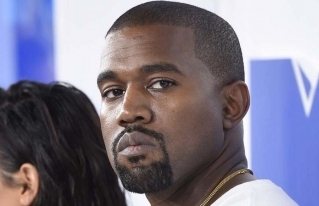 We’re not going to go into the sincerity of Kanye’s apology. For whatever it’s worth, we believe he’s being genuine, so far as that goes. However, as longtime lovers of the performing arts, we here at Celebrity Slam simply cannot let such an egregious flouting of the social contract stand unaddressed. There are certain things that you just should not do in a theater. To do these things is a grievous breach of etiquette. And farting around on your phone is absolutely one of those things. To be a performer on the stage, a living, breathing person trying to maintain an appropriate sense of the moment, and to see a face or faces underlit by the sterile glow of a cell phone screen – it’s maddening. It is abjectly disrespectful. And make no mistake – they CAN see you, no matter how sneaky and low-key you think you’re being. Your face lights up in the night, a beacon in what is supposed to be a sea of darkness. There’s a reason they mention it beforehand. You’re not at a movie. You’re not even at a concert. You’re watching a play. Those people know you’re there; don’t make them more aware of your presence than they already are. Hell, especially if you’re Kanye West. At that point, people are watching you watch the show, and if you’re not paying attention, that gives a certain kind of person a perception of the quality of the show, a reason to also not pay attention. You’re a tastemaker, man – this is the kind of thing that can have real impact on this show’s success. Use your head for once. So yeah – we don’t care who you are. If you’re watching a play, put your phone away.